“Caesar is a 2 year old Neapolitan Mastiff Cross that came into the care of Christchurch Bull Breed Rescue and was diagnosed as having a ruptured cruciate. Kathleen started her rehabilitation work with Caesar once he was at the recovery stage from the surgery on his leg. Kathleen accommodated us by coming to the rescue every Saturday before our opening hours to work with Caesar; she developed an exercise plan that we could easily work with in a rescue environment with our limited resources. He learnt quickly to love the beep from the laser therapy machine, as he got a treat from Kathleen each time and would give her hand a bunt if she was taking too long delivering that treat. 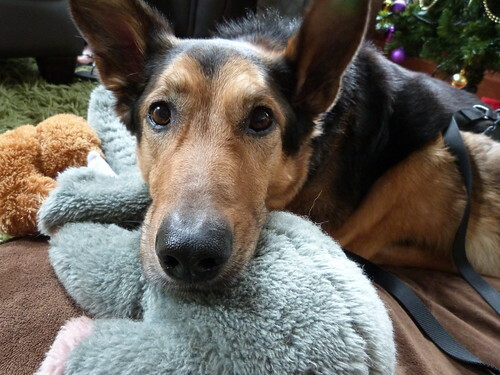 “We got referred to Kathleen from our vet when Buster was starting to suffer from arthritis. We started him on a good regime of medicine for his aches and pains and some supplements. Kathleen came to our house and talked with us about what she thought she could assist us with for Buster. He was a bit hesitant at first and I had to stand next to him and help settle him while Kathleen did her thing. Over time Buster learned to settle and have a snooze up on the table. He knew when the session was coming to an end and he would get ready for his treats. Kathleen’s work with Buster and her advice on other things we could do to help him out made the last few years of his life more comfortable and gave him some extra time with us. He knew when he was due for a massage and when we told him that Kathleen was coming, we could see him perk up and we knew he was looking forward to his quality time. “Zoe, our retired greyhound, and I attended one of Kathleen’s massage workshops. During this workshop it was noticed that Zoe was tender in her hind legs and there was a difference in muscle development on each thigh . She had trouble jumping into cars and onto things like beds, waiting instead to be lifted. “Kathleen was recommended to me by Chrissy, the Mobile Vet Nurse. I had no reservations about engaging Kathleen. If Chrissy thought Kathleen was what Louie needed, then that was that. At the first visit, Kathleen was very thorough and professional and Louie loved her. Louie started with weekly massages, laser treatment, acupressure, dietary advice and homeopathic options for his problems. Unfortunately for Louie, what initially started out as treating spinal issues and uncomfortable digestion have ended up being palliative care for neuroendocrine cancer. Louie now has acupressure to boost his immune system every five days but, if needed, those sessions will increase; he loves these sessions. During the period of tests and surgery for Louie I found Kathleen to be tremendously supportive and a breath of fresh air when things got a bit too much. Louie will continue to have palliative care from Kathleen because I feel her skills and knowledge are helping Louie stay with us for longer than he would if he were not getting such treatment. I thoroughly recommend Kathleen, I only wish I knew about her earlier.”- Mary Bamford (Louis passed away in May 2015, and made his final trip to the vet in Mary’s arms). 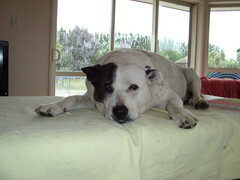 “Kenny is our 12-year old precious Blue Heeler/Bull Terrier cross. After being hit by a car when he was young and then suffering a stroke in 2011, his back gets very sore and his left side has become very weak. As the years have passed Kenny has found it more difficult to walk long distances and to fetch the Frisbee which he once did with ease. But, since getting his massages from Kathleen, Kenny has been able to remain mobile; he’s no longer as stiff, and he can even chase his beloved Frisbee every now and then. 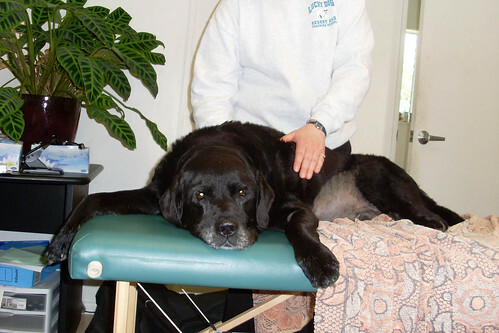 “I have been bringing my 3 legged, 12 year old Labrador, Bran, to Kathleen for a 6-weekly massage for three years now. Bran loves his visit to Kathleen. She eases all of his aches and pains and makes his life that much more comfortable. Kathleen is kind and caring towards Bran and myself. She is very knowledgeable in all areas of animal care, always quick to give advice and ideas on remedies and supplements to help. Kathleen is always willing to go the extra miles using her own time and resources to find additional information. 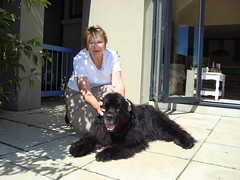 “Kathleen has been amazing working with Baxter after we chose a conservative approach to his ACL injury. Her visits are highly anticipated – Baxter waits by the front door whining with excitement. 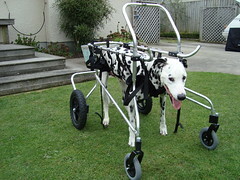 The regular massage and laser treatments have definitely helped with his recovery – he has made steady progress. “Thank you for the tender care you gave to Abby before she passed. After watching her deteriorate so rapidly and undergo so many operations to fix her lameness and chronic pain, I have to confess that it was with some desperation that I contacted you originally, but now, my only regret is that I did not do it sooner! To watch our much-loved Abby who had suffered for so long, flop on your massage table, relax and trust your touch is something I will not only never forget but also will always be grateful for! She always greeted you at the door with a wagging tail (she rarely moved for most) and she was never hesitant as you lifted her onto the table! Your advice was given without any hidden agenda or personal gain and I have no doubt that she found relief in your work, something no one else had managed to do for her. “Dixie is our five year old Wheaten Terrier. We were doing agility with Dixie but over time she was having trouble going over jumps. She had no problem with the first few but would then start knocking them down, eventually she wouldn’t jump at all…so we gave up, thinking she was just lazy. She became grumpy with our other dogs and would not play; her usual enthusiasm for the tricks she could do dwindled and walking became a chore for her, getting to the point of limping and lagging behind. It was now evident she was very sore somewhere. At this point we thought some massage therapy with Kathleen might help Dixie and what a huge transformation. She is now back to her old self, running around and playing with our other dogs, doing her tricks with great enthusiasm and loads more energy on her walks. My sister looks after our dogs when we travel and she commented last time how much nicer Dixie was, which we can only attribute to Kathleen’s weekly massages, although these have now progressed down to once monthly. “Blackout is our gorgeous 13-year old lab mix. “We would like to thank you for your kind and caring way with Meg, our 14-year old border collie, over these last few weeks prior to her sudden passing. Meg wasn’t a dog that enjoyed being handled by anyone or picked up, but she made a certain connection with you and accepted that you were helping her. We felt that the massages and laser therapy really helped her. 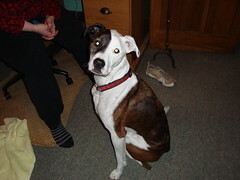 Meg loved her walks, playing with her footie and having fun with the family even at her age. “Our beautiful boy passed away at age 7.5 from CDRM which is a progressive neurological disease. I was recommended Kathleen by the Dog Swim Spa to help with maintaining his muscle tone and for relaxation. Jaffa loved her visits and was very relaxed with increased mobility after his session. Kathleen is just wonderful. 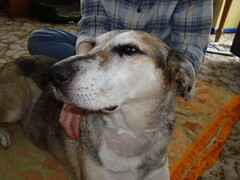 She is extremely knowledgeable and recommended supplements that would assist Jaffa’s condition. Thank you Kathleen for helping make his final months more comfortable. We so love and miss him. ” – Hayley Powell (Jaffa passed away in March 2013 in Hayley’s arms, with one last wag of his tail). “Our vet recommended Kathleen, after having a very frustrating time healing Basil’s lick granuloma. The laser therapy combined with Kathleen’s holistic approach and suggestions with which to manage Basil’s lick granuloma and other symptom’s of anxiety have helped us in being able to better manage his condition (leaving us and Basil a lot happier). “Sophie was always an old girl, but she was very active. I always thought of her as part Labrador, part mountain goat. We spent many hours together in the weekends enjoying bush walks and beaches. When arthritis took away her ability to run up and down hills and jump onto precarious look-outs, it was very sad. She had got to a point where she couldn’t even complete a walk around our local park. “Renee is a 12 year old Newfoundland who started having spinal problems which affected her back leg. Since Kathleen has been giving her massage therapy, Renee is now pain free and has shown good improvement. Thank you for the genuine love and care that you give Kenny each and every visit. Bertie gets very excited when he sees Kathleen as he loves his hour of massage. He flops down and goes into doggy heaven mode. Your advice was given without any hidden agenda or personal gain and I have no doubt that Abby found relief in your work, something no one else had managed to do for her. Coffee and I came to your massage class last weekend and, when we were doing hands on, I noticed a golf-ball sized lump on her. I took her to the vet and they have operated and removed it, so just wanted to say thanks as would not have come across it if it wasn’t for your class. Izzy has seen Kathleen four times now and we have had great success. Before the treatments she was limping and after, she is now walking limp free! Louie loves his sessions. He will continue to have palliative care from Kathleen because I feel her skills and knowledge are helping him stay with us for longer. I celebrated my 10th birthday with a cake. I’m the one with the white face. Lying down (left to right) are Elrond and Richmond. Standing (left to right) around me are Strider, Gandalf, and Rowena. Our beautiful boy passed away at age 7.5 from CDRM which is a progressive neurological disease… Jaffa loved her visits, with increased mobility after his session. Kathleen is just wonderful…Thank you for helping make his final months more comfortable.